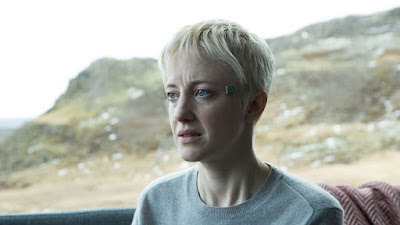 It seems that after starring in Panos Cosmatos' Sundance genre film Mandy, Andrea Riseborough now has a taste for that horror life. Deadline reports Riseborough is in talks to star in the latest reboot of The Grudge, which we previously learned will be directed by The Eyes of My Mother's Nicolas Pesce. This will be a different take on the popular J-Horror franchise, which came to our shores with successful remakes in 2004, 2006, and a less successful one in 2009. Midnight Meat Train writer Jeff Buhler will pen the script that presumably will still follow those affected by a supernatural curse. Riseborough will play a detective and young single mother. Sam Raimi is on board to produce, just as he was for the previous movies. This will be the 12th The Grudge/Ju-On movie, including a Japanese crossover with The Ring back in 2016. Don't be surprised if we get something like that here if this reboot goes off without a hitch.